A boozed-up woman spat in an officer's face after police were called to New Year's Eve trouble at a family party, a court heard. Rose Abbott had lashed out when police and paramedics were called to her mother's Haven Street home, after reports a woman was very drunk and suicidal, Burnley magistrates were told. The 21-year-old struck while on a suspended sentence imposed last May for a " terrifying" hockey stick attack on a friend. On that occasion, Abbot had set about Eloise Cottam with the weapon, battering her repeatedly in the arms and ribs and flooring her whilst Abbot's mother tried to stop the beating. 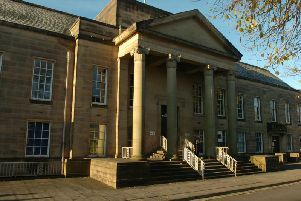 After the incident, she had admitted assault causing actual bodily harm and possessing an offensive weapon and had been given six months in prison, suspended for a year, at Burnley Crown Court. At the latest hearing, Abbot's solicitor Miss Janet Sime said the defendant had thought it was safe to have a drink as she was at a family party, but her medication had been changed. Abbot, of Kay Gardens, Burnley, admitted assaulting a police officer and being drunk and disorderly. The Bench, who told her spitting was abhorrent, imposed a six month curfew, between 7pm and 7am. The suspended sentence was extended for six months and Abbot was ordered to pay £100 compensation to the officer.